Aid groups have raised alarm over the deaths of three migrants on Greece's Lesbos island inside a week. 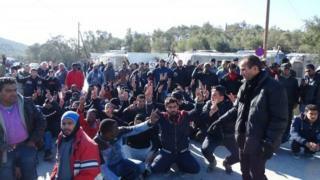 They said that poor conditions at an overcrowded camp in Moria presented a "serious risk" to at least 3,000 migrants living there. A man in his 20s said to be a Pakistani was found dead in his tent on Monday. A 22-year-old Egyptian man and a 46-year-old Syrian man who shared a tent died last week. Reports suggest they inhaled toxic fumes from heaters. Greek police are now investigating the deaths. Local media have cited carbon monoxide poisoning as a possible cause of deaths, as the cold winter weather has forced many migrants to use heaters and wood-burning stoves to keep warm. "Something has got to give," International Rescue Committee Greece director Panos Navrozidis was quoted as saying by Reuters. "We cannot tolerate this wanton loss of life." The Doctors of the World charity said poor conditions at the camp posed "serious risk" to migrants. More than 60,000 migrants and refugees - many of them from conflict-ravaged countries like Syria, Iraq and Afghanistan - currently live in camps around Greece. Aid groups say many of the camps are overcrowded, with Human Rights Watch describing the conditions in some of them as "deplorable and volatile".